Goethals nips Sveinsson at the finish. Verzbicas makes history! Meghan Goethals and Chelsey Sveinsson provided one of the most exciting finishes in the history of the Foot Locker Cross Country Championships as Sveinsson took an aggressive lead with 600m to go, only to have Goethals close the 5 second gap in the final 150m. Lukas Verzbicas made history by becoming the first sophomore boy to win the historic championship in an aggressive runaway win. Click on a name to see a bio and photos of each athlete. FLCC Alumni Kara and Adam Goucher Welcome a son: Kara Goucher gave birth to her first child, a son named Colton Mirko Goucher. Congratulations! 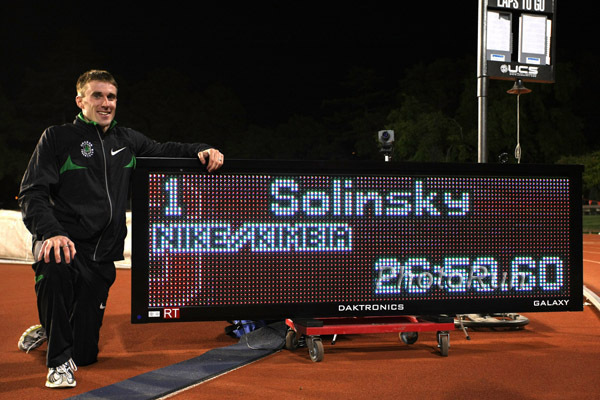 '02 FLCC Champ Solinsky breaks American 10K Record. FLCC Alum Jenny Barringer runs world-leading 4:08 in the 1500m. For the past 31 years the Foot Locker Cross Country Championships have provided a forum for runners of all abilities to race in the most exciting racing series in high school sports. National champions, All-Americans, and Olympians have added to the prestigious history of FLCC, but the series remains true to the sport of cross country and the runners who participate. There is a race for you. Where will your dreams take you?